It's lonely—and boring—at the top for the champion welterweight, who easily dismissed a supposedly worthy opponent Saturday to go 45-0 and continue a 17-year winning streak. And Floyd Mayweather Jr. has won yet another boxing match. The American boxer hasn’t lost in 17 years, and he handed 23-year-old Mexican superstar Canelo Alvarez his first loss in Saturday’s super welterweight mega fight. Mayweather, who was guaranteed $41.5 million, is now 45-0. The fight followed a script similar to previous Mayweather bouts. He sized up his opponent early, peppered him with quick jabs, and then used a variety of combinations to tire, confuse, and hurt his opponent. Mayweather would throw 505 punches and connect on 232 (46 percent) while Alvarez would throw 526 punches and land 117 (22 percent). 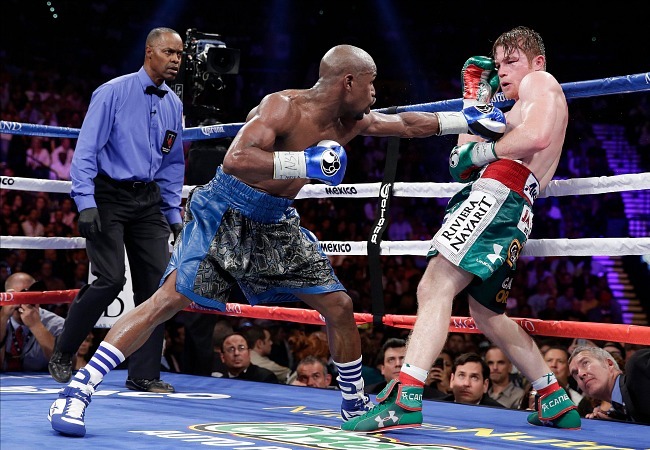 Putting it simply, Mayweather landed a lot; Alvarez missed a lot. Mayweather, 36, moved like a much younger man; he dodged and darted while Alvarez punched a lot of air inside the MGM Grand Garden Arena. Alvarez looked exhausted by the sixth round, while Mayweather looked fresh and slid around the ring with ease. It was another routine win for the best fighter in the world—same script, different opponent. But Mayweather's dominating performances might just be posing a problem. His fights seem so easy that they lack drama. Alvarez came into the match undefeated, and the boxing public was anxious to see these two men battle. Would an aging Mayweather be able to keep up with a young man? But Alvarez was so easily out-matched that it raises the question: Who can ever challenge Mayweather? What happens to an athlete when no one is good enough to test him? There was a moment in the 11th round that perfectly emblematized the Mayweather dominance “problem”—in other words, why he is so fun to watch, and yet almost too good. There was Alvarez missing on a punch so badly that he hit the rope; Mayweather was already half way across the canvas as Alvarez haplessly tried to regain his balance. Mayweather stared at the rope, as if to say, “Hello, I’m over here, why are you hitting the rope, way over there?” Alvarez—on paper, at least—was the ripest challenger of any. There are hundreds of boxing matches throughout the year, but there's usually one boxing event per year that becomes the focus of the sport. Mayweather-Alvarez was that event; its promoters proclaimed it the “greatest fight of all time” and the like. That wasn’t exactly true, of course, but the event did spotlight the sweet science, a onetime blue-collar sport that has become one that costs money to watch. With compelling fights between elite fighters now broadcast on Showtime and HBO, boxing as a whole has had a very good year, but Mayweather’s fights usually become the most talked-about events among both regular and casual observers. The promotional effort around Mayweather is so intense that his matches have become boxing’s equivalent of the Super Bowl. Mayweather has a deal to fight four more times. In reality, there aren’t four real opponents out there. And yet the fights will happen because there is money to be made, and people would like to see Mayweather, who has brilliantly crafted his image as a villain, lose. Mayweather, his promoter, and Showtime will sell Mayweather to the world and create enough doubt in the public’s mind that the next opponent, and the next, and so on, have some sort of chance in their mind. Boxing has always been a huckster’s sport. Of his enormous paydays, Mayweather says, "We're looking to break records, what else can I say?" Mayweather has figured it out. Because of his dominance, his fights will never go down as epics, but he doesn’t get hit much, he makes millions, and he never loses. Like it or not, we're living in the Mayweather Era of boxing. For his next fight, he will likely fight Danny Garcia of Philadelphia who also fought, and won, on Saturday. Garcia is another rising star who is undefeated. But the reality is that it probably won’t matter.